As I discuss in this question, by far the most popular school of Hindu philosophy is the Vedanta school, which bases its tenets on the doctrines laid out in the Brahma Sutras, a work by the sage Vyasa which summarizes and systematizes the philosophical teachings of the Upanishads. You can read the Brahma Sutras here. (The Bhagavata view that Samkarsana and others originate successively from Vasudeva and others is wrong), since any origin (for the soul) is impossible. And (this view is wrong because) an implement cannot originate from its agent (who wields it). Alternatively even if (it be assumed that Vasudeva and others are) possessed of knowledge, (majesty etc.,), still the defect cannot be remedied. Besides, (in this scripture) many contradictions are met with and it runs counter to the Vedas. 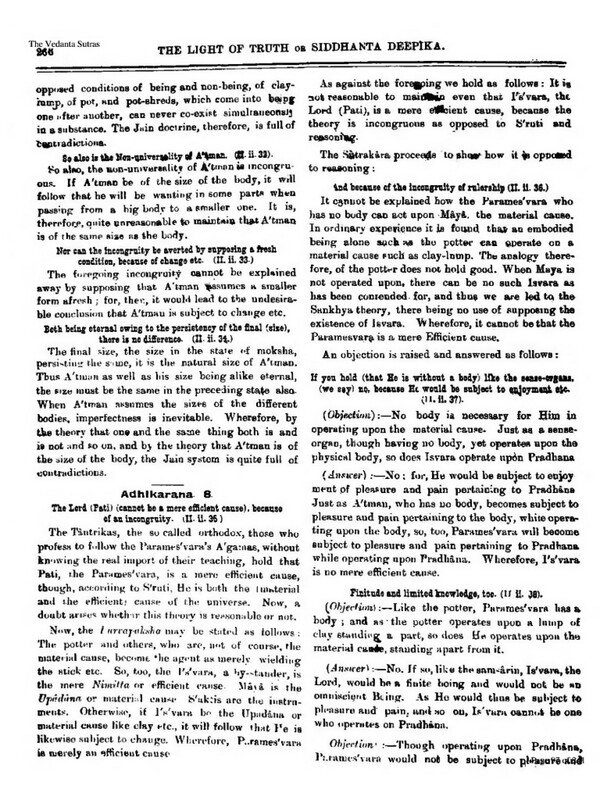 Now most commentators on the Brahma Sutras agree that Adhikarana (Topic) 7 refers to the philosophy of the Shaiva Agamas, the defining texts of Shaivism, and Adhikarana 8 refers to the philosophy of the Pancharatra Agamas, the defining texts of Vaishnavism. Where they differ is on how they interpret Vyasa's attitudes toward these two philosophies. 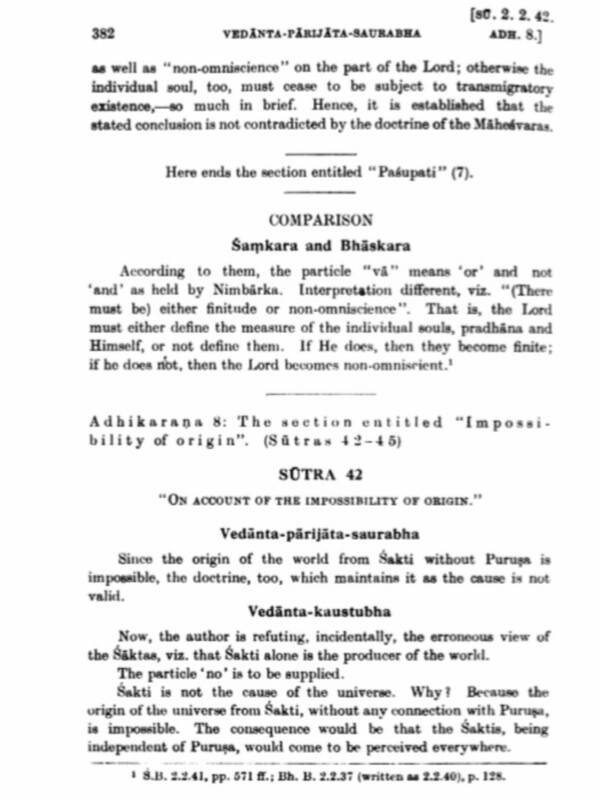 The Advaitin commentator Adi Shankaracharya argues that in Adhikarana 7, Vyasa is criticizing the Shaiva Agamas for their belief that Ishwara (The supreme lord) is only the efficient cause of the Universe, as opposed to the Vedanta school's view that Brahman is both the efficient cause and the material cause of the Universe. And he argues that in Adhikarana 8, Vyasa is criticizing the Pancharatra Agamas for their belief that the Jiva emerges from Brahman, as opposed to the Vedanta school's view that the Jiva has always existed (as I discuss here). 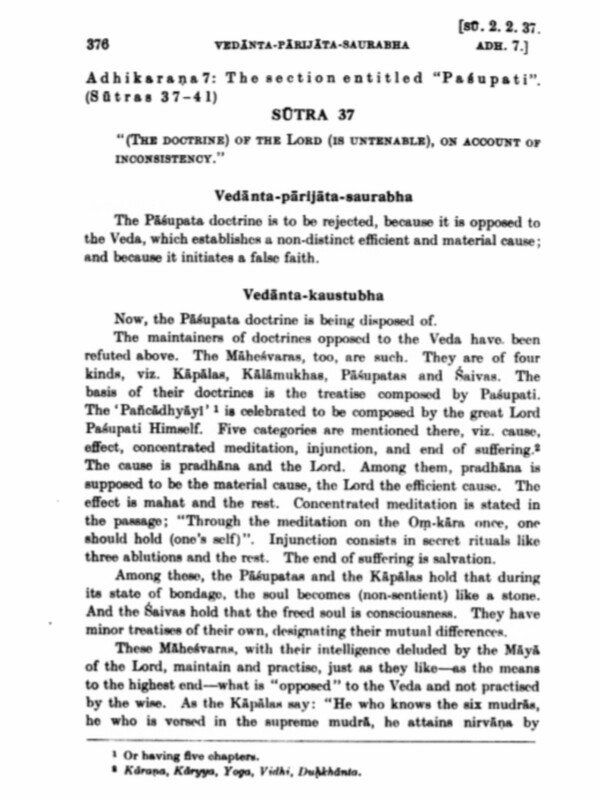 Now as expected, Shaivite commentators dispute Adi Shankaracharya's interpretation of Adhikarana 7, and Vaishnava commentators dispute his interpretation of Adhikarana 8. In each case, they either say that Vyasa is criticizing people who misinterpret the philosophy in question, not the philosophy itself, or they say that the Adhikarana is referring to a completely different philosophy than the one Adi Shankaracharya thinks it refers to. But my question is, is Adi Shankaracharya the only commentator on the Brahma Sutras that believes that the Brahma Sutras are criticizing both the Shaiva Agamas & Pancharatra Agamas? As you can see, only Adi Shankaracharya answers "Yes-Yes". So are there other commentators that give the same answers? There are some commentators who have no sectarian affiliations, like Bhaskara (whom I discuss here) and Vijnanabhikshu, so how do they interpret these two Adhikaranas? What about commentators belonging to sects other than Vaishnavism or Shaivism? Have any Shaktas, Ganapatya, Sauras, or Kaumaras written commentaries on the Brahma Sutras? And what about the Vaikhanasas, who worship Vishnu but do not follow Pancharatra Agamas? Do they interpret Adhikarana 8 as a criticism of the Pancharatra Agamas, or do they think it refers to their own Agamas. 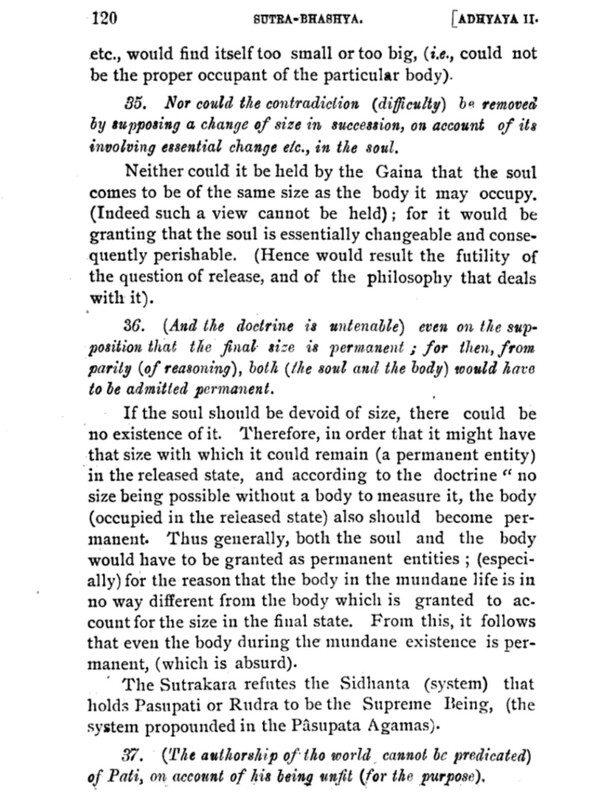 Srinivasa Dikshitar wrote a Vaikhanasa commentary on the Brahma Sutras, as I discuss here, so I'd be interested in hearing what he has to say on this issue. Also, are there any commentators who would answer "No-No", i.e. who would say that the Brahma Sutras do not criticize either the Pancharatra Agamas or the Shaiva Agamas? I assume that especially the sort of people who believe in religious unity would tend to believe that all the major sects following Agamas are correct in their philosophical doctrines. Browse other questions tagged philosophy vaishnavism brahma-sutras shaivism adi-shankaracharya .